mJabber is an instant messaging client for mobile phones, PDA or other wireless devices. It is written in J2ME. You can send and receive messages like on any other pc instant messaging application like ICQ, MSN Messenger, etc. There's no need to wait for replys anymore - chat directly with your friends! 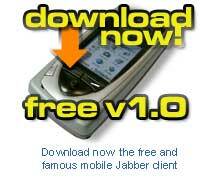 Download the mJabber client - for free! View the complete feature list for more information.